- Decide to close all my trades last week to avoid weekend! - Learn a lesson, that's I have to apply my rules and do not risk too much for each trade. Today, after a pull back because of price entering the middle of channel. - Close half trades with 100 pips profit. - Depend on analysis, may close all to avoid weekend. 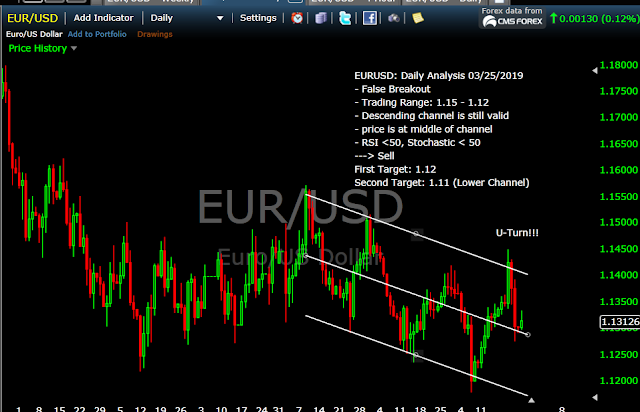 My descending channel is look different than the previous one, and that is the art of classic technical analysis. My trading system also has a sell signal. Descending Channel- Can it reach the other band? - Lock in 100 pips profit for one sell trade. Aim for second target if RSI is below 30. - Ready for Buy Plan depend on descending channel and reverse system.